I was in Phoenix and Sedona over the weekend to say goodbye to a wonderful and amazing woman whom we lost too soon, my mother-in-law. Our reason for being there was sad, but Sedona is beautiful. The perfect place to celebrate the life of a beautiful woman who brightened the spirits of everyone she met. If you ever find yourself driving between between Phoenix and the Grand Canyon (or Flagstaff), the (slight) detour through the valley of red rock is worth the trip. Sorry for your loss, Gwen. Sounds as though she was as lovely as the area you describe. Thanks, Mark. She really was. Sorry to hear that, but I’m glad you had a great celebration of her life. Coincidentally, my wife and I—along with my wonderful parents-in-law—went to Sedona last year as part of our road-trip that went from San Jose to Vegas, Grand Canyon, Williams, Sedona, San Diego, then back to San Jose. We agree, Sedona is so beautiful and we’re going to go back next year. What a great road trip, Rich. Enjoy your return to Sedona next year. 🙂 Thanks! I am sorry for your grief. The loss of a parent reverberates far longer and in ways we never dream. Give your husband our best. Isn’t that little Canon a great camera? We love it for sky and landscapes. Canon got that one right. Sorry for your loss, Gwen. May you and your husband find solace in good memories of her. 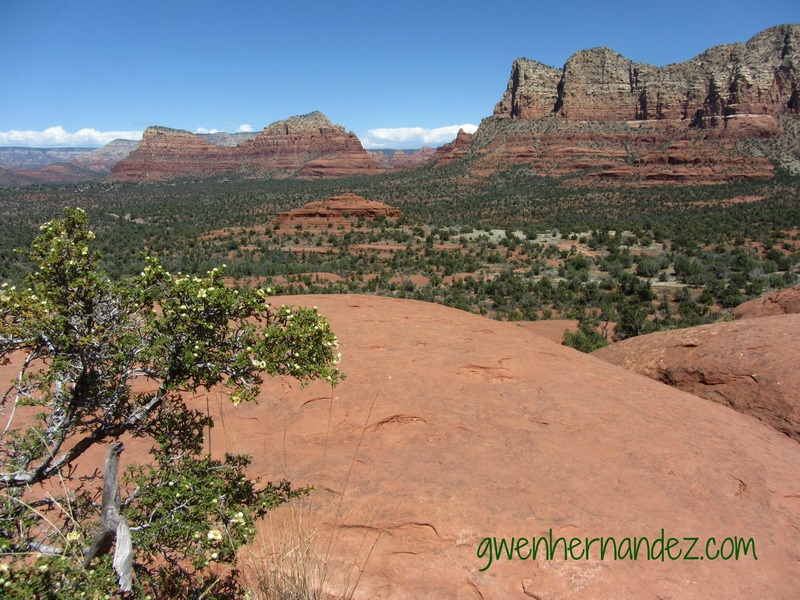 The Sedona area is about a 40-minute drive from my house in Prescott. The north central desert hills of Arizona are full of impressive sights and I’m glad you were able to experience some of them. Sorry for your loss. peace. So sorry for your loss, Gwen. Hugs to you and your family. Please accept my condolences, along with the others. Life & it’s end is such a paradox. I’ve said farewell to a number of truly beautiful people, at this point in my life. Friends, brothers & sisters in arms, relatives…when they are gone, they take part of us with them, but I choose to remember what they leave behind for all of us. But what a perfect place to reflect on the beauty of those who have moved on. Sedona, where the wind whispers to us of those who have crossed over…and of our tomorrows.